Comprehensive nondiscrimination protections for the state of Delaware’s public schools, proposed by Governor John Carney earlier this summer, are close to being passed before the end of the year, ensuring that the state’s transgender students are protected from discrimination in public and charter schools. In July, the Governor asked the Delaware Department of Education (DDOE) to draw up a draft model nondiscrimination policy which would have strong protections for LGBTQ students, now known as Resolution 225. Specific protections in the draft include: allowing students to use the restrooms and locker rooms that best correspond to their gender identity, allowing students to participate in the team sport that best matches their gender identity, and allowing students to designate their preferred name on school records. These protections are in line with policies on the books in school districts across the country—from Oregon to Chicago to Washington DC—that put the wellbeing of students front-and-center. But opponents of equality are pushing back with a smear campaign spreading lies about who transgender students are, in an effort to dissuade the DDOE from adopting these potentially life-saving protections. Public comment on the issue remains open until next Monday, December 4. 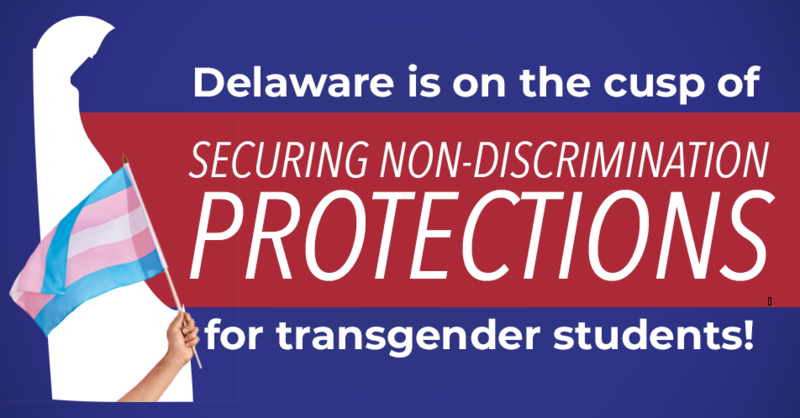 Delaware residents who support protections for transgender students can comment by taking action with Equality Delaware here. Click here to keep up with the latest Delaware news regarding nondiscrimination.